Dasypogonaceae is a botanical name of a family of flowering plants. Such a family has not been commonly recognized by taxonomists are the plants involved were usually included in the family Ashphodelaceae. 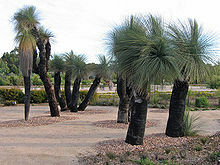 The family is native to Australia, and contains 16 species in four genera. This page was last changed on 25 April 2017, at 23:46.